DIY ASSEMBLY: Enjoy the satisfaction of completing your own DIY 3D printer kit, while also becoming familiar with the inner workings of the machine and developing a deeper understanding of the principles behind 3D Printing. -High-precisions ball bearing wheels made from Delrin/POM engineering thermoplastic deliver high stiffness, low friction, and excellent dimensional stability helping to reduce noise levels greatly. NEW Y-AXIS DESIGN: Redesigned with a much more sturdy, 40x40 aluminum extrusion for the Y-axis base. This provides unprecedented stability for the printing surface, resulting in upgraded print quality. SUPERIOR PRINTING SURFACE: Our all new state of the art “C-MAG” magnetic bed, is completely removable, and flexible. The textured surface adheres to all types of filament better than traditional methods such as tape, glue, or hairspray. No more model warping on larger prints! Once the model is finished printing, remove the magnetic upper from the lower and bend or flex the print surface to watch the model effortlessly popoff the printing surface. BRAND NAME POWER SUPPLY: Meanwell, a well-known company with over 30 years of experience in the power supply industry, manufactured power supply. Ensures safer and faster heating of all necessary components. RAPID HEATING: Paired with the new high-quality power supply, the Ender 3 heated bed can now reach temperatures of 110*C in just 5 minutes. Making the Ender 3 suitable for many different types of filaments. PRECISELY MANUFACTURED: High-precision CNC machining techniques used for all metal brackets and mounts, guarantees precise positioning and an all around more stable structure. ENHANCED BED LEVELING: All new, ergonomically designed, larger bed leveling nuts, makes leveling the bed much easier and more precise, to make sure you spend more time printing, and less time leveling. Need some modes just took my time making it and made shore it all squared up and worked 1st go. here some of my prints. 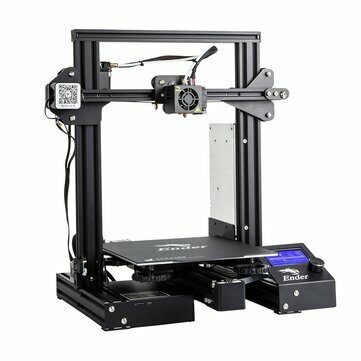 Rapido envio, aparentemente todo esta bien pero no he armado la Ender 3pro. Tienda muy recomendable 100% Un producto enviado desde china excelente. This is a great printer for the money. The only downside is that you need to purchase some basic upgrades because some of the parts are too cheap. 1. Get a better Bowden Tube + Couplings 2. Get better bed springs With that in mind, I highly recommend this printer.